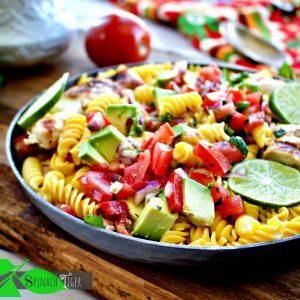 Easy, Healthy Chicken Pasta, Mexican Style. Whisk olive oil, juice of one lime in bowl. Marinate chicken breasts one to three hours. If you find you're don't have time, just marinate at room temperature for 30 minutes. You can pan fry, grill, or bake in oven. For this recipe, I prefer to grill on medium heat for about 5 minutes on each side. While chicken is grilling, cook pasta according to package directions. I used a gluten free corn/quinoa rotini pasta which compliments the dish. Reserve a cup of pasta water in case you need it. Toss drained hot pasta with pico de gallo. Add chicken to dish. If pasta seems dry, drizzle in some olive oil and tablespoon or two of pasta water. Right before serving, add avocado. Squeeze lime. Season with salt and pepper. Add garnish of chopped cilantro.